This version of the classic veal and beef based specialty of the Basque countries is named for the town of Espelette, which produces the famous ground chile powder that is one of the trademarks of Basque cooking. In Espelette, the Axoa is made with ground meat, in contrast to other versions that call for the meats to be cut in cubes. This recipe will feed 8 comfortably as a main course. Pair Axoa with a medium bodies Iruleguy red wine produced within minutes of Espelette. 1. For the ground meat, use veal from the neck or shoulder if possible. Both meats should be coarsely ground. The beef should not be too lean. 2. Peal the onions and cut in med-small dice. Seed and core the peppers and cut in medium dice. Slice the garlic, making sure to remove any brown spots, hard ends or sprouted germs. 3. Gently sauté the two ground meats in olive oil in a large saucepan. Add the peppers, onions and garlic, salt and pepper well, and sauté until the vegetables begin to soften. Sprinkle the flour over and mix well. 4. Make up the BG by tying all the ingredients tightly in cheesecloth. 5. Add the red wine and enough water to cover the solid ingredients by about ½ inch. 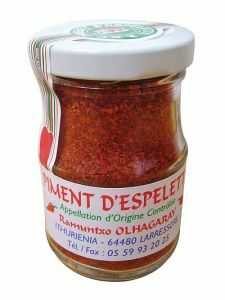 Add the BG and about 1 tsp piment d’espelette (don’t overdo the piment at this point; more can be added at the end as needed). Mix the tomato paste with a cup of warm water and stir until smooth; add to the pot. 6. Bring to a boil, then reduce to a simmer and cook 2 hours. During the cooking, add more water as needed to maintain the liquid level. When the cooking is complete, remove the BG and skim well to remove any excess fat on the surface. Adjust the salt level and add more piment d’espelette if needed. The axoa should have a bit of heat but should not be spicy hot. 7. Serve immediately or cool and reheat to order. Serve with frites or steamed potatoes. This entry was posted in Savory Dishes and tagged Beef, Pays Basque, veal. Bookmark the permalink.